In preparation for another long winter ahead, and to combat the lack-of-ocean blues we’ve been experiencing up here, Casey and I have decided to take up linocut printing. It’s a style of art similar to wood block printmaking; made by gouging designs into soft blocks of linoleum using special chisel-like tools. Ink is then rolled onto the linoleum block using a brayer and transferred to a sheet of paper by hand with a baren. Any raised or un-carved areas of the block show up as the ink color used for the “pull”. Essentially, you’re creating an oversized stamp. Many original prints in an “edition” can be made from a single block carving, and multiple colors can be applied by carving away the block with each successive pull, known as a reduction print. 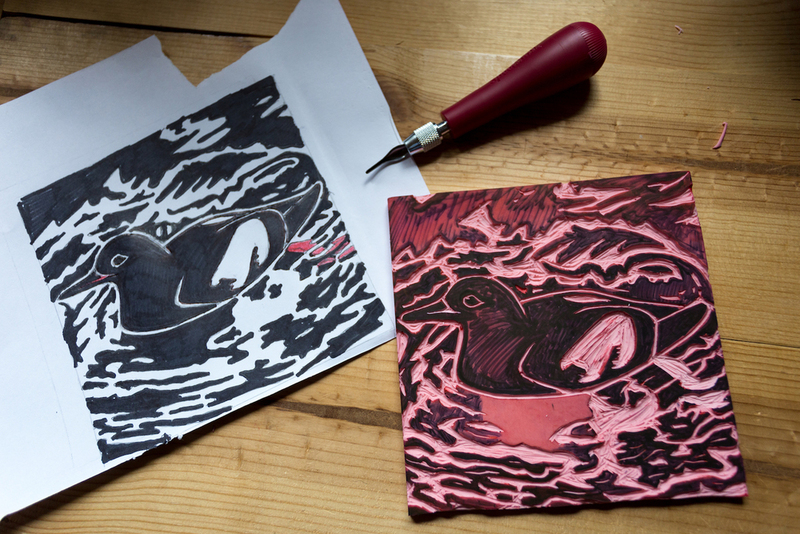 Sketch of a pigeon guillemot next to the carved block ready for printing. Pulling the second layer of black using the jig. For my first piece, I choose a two-color reduction print of a pigeon guillemot on water. It all started with a piece of reference art sketched out and colored in to get an idea of what the finished print would look like. The outline of the guillemot was then traced onto the block using carbon paper. I carved away all of the areas I wanted to remain white, such as the outline of the bird, its wing patches, and ripples in the water. I then rolled red ink onto the block and transferred the pattern to 16 sheets of paper. It took several days for this first coat of red to dry. Next, I carved away only the areas that I wanted to stay red, which were the feet and a small sliver within the bill. I then rolled on a coat of black ink and transferred the image on top of the red layer, using a homemade jig to ensure the layers would line up and come into registration. The jig worked okay, but there were some issues getting the two layers aligned for some of the prints. You can see in the above photos of the finished prints hanging to dry, that most of the red was covered up by the final coat of black. Lessons were learned from this first attempt and adjustments will be made going forward. Coming up next, a three-color reduction of a whiskered auklet.